The real savings can be easily counted in production cost per part! The higher your hourly output is, the lower your unit production cost will be, in just a word, the advanced solutions built into Omera presses guarantee better production performance. Savings in operating costs are guaranteed because machine capacity can be utilized to the fullest without dead times caused by breakage or malfunction. Maintenance operations can be scheduled in advance with the assurance that everything has been made as simple as possible. 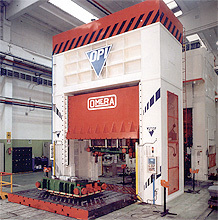 The first benefit of the trademark structural strength and constructive accuracy of Omera presses ensured by the highest design and manufacturing standards is the optimum performance of the tools, which can be translated in terms of defect-free production thanks to the uniform distribution of force throughout the production process. In addition to ensuring repeatable product quality standards, standard-series production also guarantees quick delivery and set-up for operation. Many models are in stock – please call to inquire. Wide assortment with each model in a range of different versions helps you choose the most appropriate machine for your needs. 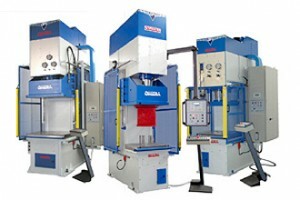 The technologies applied in Omera presses maximize system efficiency while permitting special types of machining to let you lower production costs at the same time. The large choice of models and configurations help meet every production requirement. In addition to the best of breed components utilized, quality construction, decades of experience, and technological leadership result in extraordinary press reliability. Generous sizing in combination with painstaking attention to detail during machining, ensure the repeatability of production process and the longest possible working life of the tools. The ample assortment of accessories available helps you customize your press while benefiting from the use of a product designed and constructed for a specific purpose. 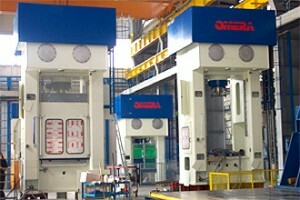 Automatic machines come into existence during the design phase, and Omera presses are designed for also automatic operation right from the start. Using an electronic interface, the press is instantly ready for connection to external devices and operation in complete safety guaranteed by both protection signals and CE certification. This series is designed for applications where high structural rigidity and production flexibility are required. These Machines have multiple action and special cycles for the production of complex shapes and large dimensions. Industrial – Structural Elements, Tank / Vessel Ends.